The shockwaves of Black Friday and Cyber Monday are still being felt in the UK charts, as some discounted titles are still disturbing the new releases. 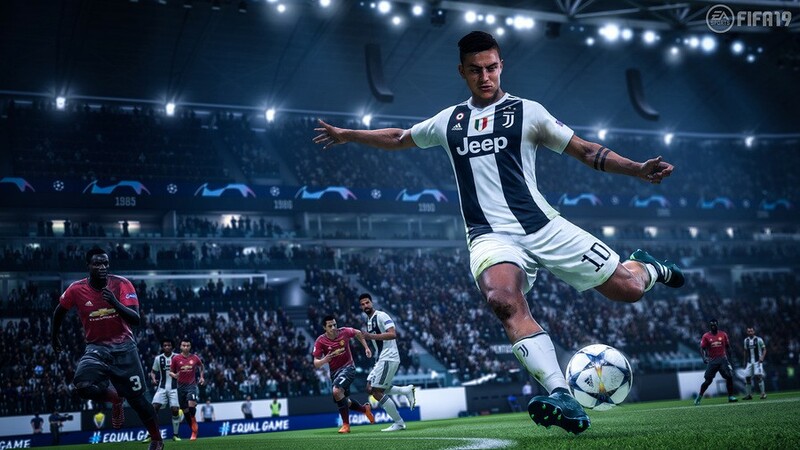 FIFA 19, for example, takes the top spot for a second week, followed up by Red Dead Redemption 2. It swaps last week's positions with Call of Duty: Black Ops 4, and Battlefield V is holding firm in fourth. Spyro: Reignited Trilogy has flown up from ninth to sixth, while Marvel's Spider-Man is swinging pretty low into 16th place. However, perhaps the worst case this week is Darksiders III, a new release that debuts at number 32. Of course, there's no accounting for digital sales, but according to GamesIndustry, its sales fall well below the previous two games in the series. It'd be interesting to know whether its performance on digital stores makes up for that, but it's pretty damning nonetheless. Anyway, here's the latest top 10. Not the end of the world for Darksiders 3. Darksiders 2 needed to sell 2-3 million copies to break even. Darksiders 3 apparently (can’t find the interview) only needs to sell a few hundred thousand copies to break even. I’m convinced the game will find an audience in time & will be a far better game then (it’s the buggiest game I’ve played this gen). Also worth mentioning that the digital deluxe edition was available for preorder for less than retail price (£45) & that comes with the season pass. FIFA 19 is the same game since FIFA 17, not even a Brazilian like me would be that dumb. It's also a week when then only platform that doesn't have an exclusive in the top ten also happens to be the number one platform. Interesting. @dark_knightmare2 ‘I’ve played 😉’. Only played F4 from the games you mentioned & that was 1 year after launch. I’ve had some crazy bugs...audio bugs, skipped cut scene, slowdowns... . Still like the game though (~13hours in) & I love the Darksiders universe, but could’ve used more time in the oven & probably would’ve sold better. @Turismo4GT Sony bundled FIFA 19 with the PS4 in the UK, unlike MS & Ninty that had FH4 & Mario Kart. I reckon they’re saving the Spider-Man bundle for Xmas when the new movie is out. @Fight_Teza_Fight Fair enough, thanks for the feedback. It's criminal that Hitman 2 is only just inside the Top 40, and dropped out entirely last week. I know where the door is, I'll see myself out. Considering FIFA probably has dropped to a price much lower than RDR2 and fact it's Christmas coming I can probably know why crappy FIFA is at to (again). I'm not a football fan but i have been told my nephew wants it for the switch, got to be a good uncle and give EA some money. "It'd be interesting to know whether its performance on digital stores makes up for that, but it's pretty damning nonetheless". in a word, no. darksiders sold over 40k at launch back in 2012, 84% drop would put it something around 6-7,000 sales. i just can't see it selling 5-6 times more on PSN/XBL, to make up the short fall. plus it barely made a splash on the european charts either (which does include digital sales).. the top ten was: FIFA 19, Spider-Man, Battlefield V, Farming Simulator 19, Call of Duty: Black Ops 4, Red Dead Redemption 2, Assassin's Creed Odyssey, God of War, Pokemon: Let's Go, Pikachu!, Detroit: Become Human. @dark_knightmare2 End? I feel like the story just got started. These games are parallel. I would expect the story to end at 5 when all of the horseman stories are done and they are reunited for the final quest to...save humanity (what is the point of Darksiders again)? If the series even makes it that far. Darksiders 3 is on my radar, but I have many other games on my wishlist/backlog before I even consider getting it. Darksiders just fell under the radar of most gamers. The casuals won't have noticed it beyond the top four games and us traditional gamers have better games to spend our money on. It's sad when a new game goes unnoticed but what can you do. Does anyone know where Fallout-76 and Hitman 2 were in the charts? @suikoden thanks man. I am a little perplexed as to why hitman is doing so poorly. Did people just get burned out on the multiple editions that WB released last year? Two weeks and a Fallout title is out of the top ten. Never thought id see the day. Gutted for Hitman 2 it’s a great game, one of a kind, nothing out there quite like it. It really doesn’t deserve to be selling so badly, unlike some others that are somehow fairing better. Playing a game like FIFA19 is a great way to make the team you support do well and maybe win trophies when they can't irl. Hence why so many people are buying the game.